We already knew that Google Wallet would not be making its way to the Galaxy Nexus, and yesterday the theory came out that this was because Verizon would be supporting ISIS, the NFC payment system that it and other major carriers are backing. But now, Verizon has spoken on the issue, Google has responded, and we're left to decide who we believe. Verizon spokesman Jeffrey Nelson said in an e-mail statement to Bloomberg today that Verizon is working to have "the best security and user experience" and that Google Wallet would be allowed when it met those goals. But, Verizon has said that it isn't blocking Google Wallet, but has to consider it differently because of how it needs to be integrated into hardware. Verizon also claimed that it doesn't block software, but anyone who has tried to tether on the carrier knows that isn't true. A Google spokesman, Nate Tyler, responded to those claims by reaffirming the security in Google Wallet and that the platform had been "designed from the ground up with security as a priority." Aside from that he said/she said, the prevailing theories are that either Verizon is trying to keep out competition from the Isis system, which won't be launching until next year, or the inclusion of Wallet is part of the negotiations over contract terms and data sharing between the companies. The only US carrier that has allowed Google Wallet is Sprint, which is the only major US carrier that hasn't backed Isis. Of course, Sprint is also the only carrier with an NFC-enabled Android phone in the Nexus S.
There's no real way to figure out the truth of the whole mess, but Verizon's argument is the weakest of all, and Google has simply earned our trust far more than Verizon has.. If we're to believe the reports that the Android 4.1 update has been made to fix issues that Verizon found with the Galaxy Nexus in testing, then it would seem to follow that Google would update Google Wallet with any security fixes that Verizon deemed necessary. Anything that doesnt allow them to make more money off you is a security concern. As in their financial security. Even though they are the most profitable carrier in the US. Exactly, f**k Verizon. Either way, us hackers WILL find a way to get it on there. It was a toddlers SQL injection... tell sony to stop asking for a good front door hacking. cant fault them and give a pass to apple for the same thing. they are both the most profitable because they are riding on excellent advertising and user reviews. In Google we trust... I notice more ppl deal with VZW bull shxt for the few perks, like great coverage, but not too people respect and love Verizon. Google at least has earned the respect of the ppl who use it, for the most part anyways. they are blocking it because they have a agreement with ISIS, thats why. So if Sprint is the only carrier that allowed Google wallet and they already have it running on the Nexus S why wouldn't Google launch the Galaxy Nexus with Sprint and not fuss and fight with the 'tards at VZW? Well after all of the hassle that's been going on with the Nexus release on Verizon, I have a feeling that there won't be any more exclusive launches for a Nexus device on Verizon again. T-mo handled the Nexus launches much better than Verizon has been doing lately. 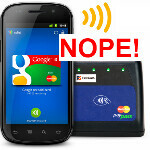 VZW: We couldn't lock the bootloader, so we're going to lock Google out of NFC instead. I bet VZW would allow it if it had VZW written on it and they got the profits...probably what they're trying to do anyway. I believe everyone here needs to come down , and not hate the phone because the minor set back, I am sure there are people working on how to unlock Google wallet as we speak, Verizon has always lock wifi tether in every single phone, and we have find a way around that, haven't we? I don't think this should be a deal breaker for the Galaxy Nexus.